Instead of sending flat, leftover cardboard boxes to the recycling center, artist Chris Gilmour transforms them into life-sized sculptures. Creating using nothing but cardboard and glue, the artist’s sculptures are detailed and refined, as if made from a more sophisticated material. Gilmour renders everything from musical instruments to medical equipment, to cars and bikes, in chillingly realistic detail. The British artist recycles packaging material into these painstakingly detailed sculptures without the use of any supporting frames, wood or metal. 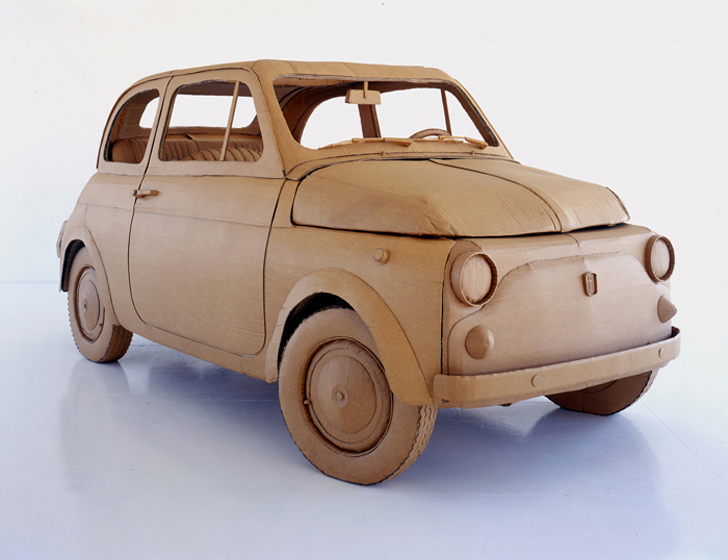 Each represents an object from everyday life, but rendered in cardboard it takes on a whole new presence. His pieces tap into our and memories of these objects and our relation to them while growing up — vintage typewriters and vacuum cleaners remind us of homework and domestic life, and a dentist chair is replicated in full detail, including examination light and spit sink. The material of cardboard – a childhood favorite for fort and playhouses – also beckons our memories of the objects Gilmour replicates, tying them in with the present. The apparent functionality of Gilmour’s cardboard sculptures often seem so real that the viewer gets confused. He has sited visitors attempting to type on his typewriters and open car doors before they realize that the pieces are in fact art works and not the real thing. Gilmour uses recycled cardboard and packaging material because of its accessibility — virtually all of his neighbors and family members throw away the material on a regular basis. Instead of traditional marble or bronze, Gilmour makes a modern and environmentally sensitive statement, while playing on our nostalgic memories. The British artist recycles packaging material into his painstakingly detailed sculptures, without the use of any supporting frames, wood or metal. Each represents an object from everyday life, but rendered in cardboard, it takes on a whole new presence. 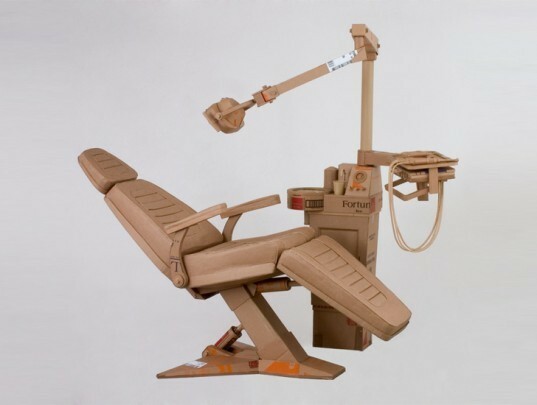 His pieces tap into our and memories of these objects and our relation to them while growing up -- vintage typewriters and vacuum cleaners remind us of homework and domestic life, and a dentist chair is replicated in full detail, including examination light and spit sink. The material of cardboard- a childhood favorite for fort and playhouse making- also beckons our memories of the objects Gilmour replicates, tying them in with the present. The apparent functionality of Gilmour’s cardboard sculptures often seem so real, that the viewer gets confused. He has sited visitors attempting to type on his typewriters and open car doors before they realize that the pieces are in fact art works and not the real thing. Gilmour uses recycled cardboard and packaging material because of its accessibility -- virtually all of his neighbors and family members throw away the material on a regular basis. Instead of traditional marble or bronze, Gilmour makes a modern and environmentally sensitive statement, while playing on our nostalgic memories.